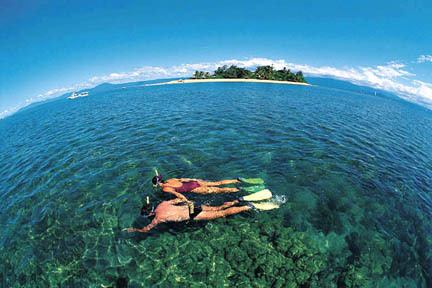 Above, two visitors tackle the Great Barrier Reef. CAIRNS, QUEENSLAND, AUSTRALIA: Some 14 hours earlier in the middle of the night, I left Honolulu Airport for a soon-to-be-realized dream, traveling to one of the most fascinating, diverse -- and, as I'll learn -- friendliest countries in the world for a two-week adventure. » The Great Barrier Reef and the Wet Tropics of Queensland. I've always loved the ruggedness of Australia, the animals found nowhere else in the world, sports-loving residents and more than 7,000 miles of coastline featuring incredible surfing. The downside was that my wife, Nancy, couldn't join me. It was one of those bittersweet moments of our 20-year-plus marriage when I've left alone for distant locales, but traveling with family or even other surfers can force compromises on where to eat, when to get up and what activities to pursue, including the dreaded shopping. I looked forward to this solo journey where I would be able to visit Queensland's coastal areas. One of Australia's five states, the country's largest, Queensland is a tropical region similar in some ways to Hawaii. Starting in the north at Cairns (pronounced "can"), I would head east to Palm Cove, Port Douglas, south to Hervey Bay (pronounced "Harvey") and Fraser Island, then to Brisbane -- Queensland's capital with 1.3 million people -- and the beaches of Mooloolaba, Surfers Paradise, and Coolangata. Two weeks seemed like a long time until I made up my "Must Do" list: Find the wild saltwater crocodiles; snorkel the Great Barrier Reef; track down one of Australia's notorious venomous snakes; play with a kangaroo and koala; swim with sharks; spot a dingo; drive along the country's longest beach on Frazer Island; attend a World Cup rugby match; chat with an aborigine; meet "Crocodile Hunter" Steve Irwin; and surf a legendary mile-long wave at Greenmount in Coolangata. And, when I wasn't trying to kill myself, I would sample Australia wines, Bundaberg Rum, Moreton Bay bugs (lobster), bharramundi -- one of Australia's finest fish -- and lots of local beef.There was one more last-minute requirement set down by Nancy. We attended a rock concert the night before I left, and a man seated in front of us was wearing a striking aloha shirt we learned was made in Australia. "Get one of those shirts," Nancy yelled from the car as she pulled away after dropping me around at Honolulu Airport. 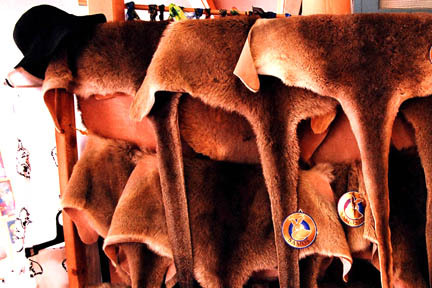 There's a major market for kangaroo skins throughout Australia. JUST BEFORE landing at Sydney InternationaI Airport, the Aussie woman sitting next to me asked about America's perception of Australia. "Isn't it where 'women glow and men plunder?'" I said, taking a cue from a popular Men at Work song of the 1980s. "We don't exactly glow but the men do occasionally plunder," she said. "We also have what you Yanks call metrosexuals: well-groomed, cologned, very polite (men in) snappy attire. And they drink flavored martinis." I figured she was describing her guy. "No way, mate," she said. "My boyfriend is the typical Aussie bloke. Rough around the edges, blustery, prone to give another mate a punch if the mood fits, infatuated with his four-wheel drive, and likes his beer." I'm going to love this country, I thought. The Brisbane native added that Queenslanders are "a bit more rebellious" than other Australians. But asking about crocodile hunter Steve Irwin made her wince. "Why are Yanks so keen on him?" she said. "He's so much more popular in the States. "People here either love or hate him," she said. "Some think he's embarrassing because he's so over the top. But he's been sensational for our tourism." I asked about Aussie food, and she showed me an article in the Sydney Herald that said, "The average Australian during his or her lifetime will eat 17 beef cattle, 92 sheep, 406 loaves of bread, 165,000 eggs, 8 tons of fruit, half a ton of cheese and 10 tons of veggies." "We do like meat," she said. It's all good, I thought. 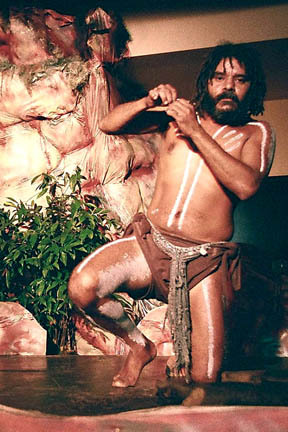 At the Tjapukai Aboriginal Cultural Park, native dancers blend their indigenous music and dance with Broadway-style theater in the Down Under equivalent of the Polynesian Cultural Center. AUSTRALIA IS THE smallest, flattest, driest and least populated of the continents. The continent also happens to be the world's largest island. A fifth of Australia is covered by 11 deserts; the Great Barrier Reef is the longest coral reef in the world, extending more than 1,330 miles along Queensland's coast in a chain of small islands and comprising more than 2,500 reefs. "And we're the only English-speaking country to have made voting compulsory in federal and state elections," my plane mate said proudly. "We have a voter turnout of 95 percent." What about kangaroos, I asked? "They don't get to vote," she said with a laugh. "But there are more kangaroos in Australia today, around 40 million, than when Australia was first settled." The jet descended through gray clouds to expose an even darker ocean as we passed over Sydney Harbor and its famed opera house. In the terminal to catch a connecting three-hour flight north to Cairns, I stopped at a money exchange booth and emerged smiling. For $100 U.S. currency, I received a little more than $130 Australian dollars! The exchange rate makes Australia a bargain for Americans. The Qantas jet to Cairns was filled with Sydneyites and Tasmanians giddy about leaving the chilly southern spring for the mild temperatures of Australia's tropics. Queensland is a state of great plains that merge into high country to the east and northwest. To the north, the country dips gradually to meet the Gulf of Carpentaria as a broad tract of salt flats. The northwest is occupied by rugged uplands, rich in minerals. Eastward, the country rises toward the Great Dividing Range running from the state's southern border to its northern tip that is the main watershed between coastal and inland rivers. East of the Great Dividing Range, the country drops seaward in a jumble of ranges separated by lowlands. This continues in a chain of mountainous offshore islands sitting on the continental shelf. Queensland has more than 1,000 species of native vertebrates. Eighty-six are unique to the region. There are also 572 species of birds and 1,600 species of fish here. Most in Queensland are descended from 19th-century British and European settlers. In recent years there has been an increasing number of new settlers from Southeast Asia. About a third of Queenslanders are migrants or the children of migrants. The warm climate, a relaxed way of life and the economic prospects, including a booming tourist and real estate industry, also attract residents from other parts of Australia. 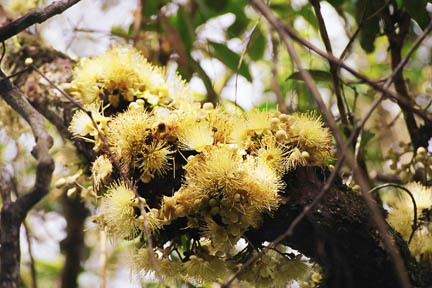 A flowery tree is one of the attractions of Skyrail Park. ONE INTERESTING phenomenon of these boom times is that just as in Hawaii, individually owned vacation units or apartments are now being rented like hotel rooms, and Outrigger Resorts of Hawaii has become a major player in this business. The apartments are fully equipped, often multibedroom units with full laundry and kitchens, available to visitors at bargain prices for families and extended stays. Outrigger Resorts manages 10 Queensland properties -- most beachfront -- offering a casual, familiar experience. Tourism is one of three major Queensland industries since the area has a number of top international destinations, including Cairns, the Great Barrier Reef, Gold Coast, tropical islands, rain forest and wilderness, open sandy beaches, the vast outback and sophisticated attractions in Brisbane. I awoke about the time the jet's wheels skidded onto the Cairns Airport tarmac. Let the adventures begin. One way to Sydney via Hawaiian Airlines: $694 Mondays to Wednesdays and $729 Thursdays to Sundays through Dec. 4; $834 and $869 respectively from Dec. 5 through 11; and $874 and $909 for travel between Dec. 12 and 28. From Sydney to Cairns: Qantas round-trip starts at about $300. » Outrigger Cairns Resort: 53-57 The Esplanade, Cairns Qld. 4870. Luxury units with ocean or pool/city views are set at the historic Cairns Court House. Amenities include a kitchen with stovetop/oven, toaster, coffee/tea-making facilities, dishwasher and refrigerator. Call 7-4046-4141 or toll-free 800-46-4141; fax 7-4046-4242. » Palm Cove: Outrigger Beach Club & Spa Palm Cove, 123 Williams Esplanade, Palm Cove, Queensland, Australia, 4879. Serenity Wing guest suites offering family entertainment areas with gas barbecues, flat-screen televisions and a private rain forest pool. Two-level penthouses feature rooftop plunge pools. One- and two-bedroom suites include fully equipped kitchens. Complimentary sedan limousine or Rolls-Royce return airport transfers are available for guests staying five nights or more at full published rates. Call 7-4059-9200; fax 7-4059-9222. » Cape Tribulation Wilderness Cruises and Fishing Safaris: Information at www.capetribcruises.com. Call 7-4098-9052, fax 7-4098-9052 or e-mail info@capetribcruises.com. » BTS Tours: Operates one- and two-day small-group adventures to the Great Barrier Reef and Rainforest Coast of Australia's tropical north, including historic Cairns, the pristine wilderness areas of Cape Tribulation and the Daintree Rainforest, the colorful village of Kuranda and the Aboriginal culture of Mossman Gorge and Tjapukai. Visit www.btstours.com. » Cockatoo Hill Retreat: 13 Cape Tribulation Road, Daintree, North Queensland, 4873. Call 7-4098-9277, fax 7-4098-9207, e-mail info@cockatoohillretreat.com.au or visit Web site www.cockatoohillretreat.com.au. » Rattle & Hum: This is a busy, casual pub-style restaurant serving oven-fired pizzas and steaks. Main meals are priced around $15. » Kani's: Popular seafood restaurant on the Esplanade serves a wide range of seafood. Main meals are about $20. Sit inside or upstairs enjoying the view of Trinity Inlet at night or dine al fresco on the footpath. Kani's also features a large selection of Australia's premium wines and beers. Dress style: Casual, smart. Tourism-oriented outlets open seven days, as do convenience stores supplying basic items. Most shopping centers are closed on Sundays. » Pier Marketplace: Numerous stalls offer souvenirs, food and fashion. Here, you will also find Undersea World, where you can enjoy all the creatures of the Great Barrier Reef without getting your feet wet. An art gallery on the lower level has some superb paintings and prints of Cairns and the Great Barrier Reef. On the second level you will find restaurants offering seafood, Italian and Chinese cuisine overlooking Trinity Inlet. Open daily. » Cairns Central Shopping Centre: Hundreds of specialty stores just passed Shields Street offer a variety of goods and services, with abundant souvenir and gift shops. National and international brand merchandise can be found at Myers. A cinema complex sits next to an international food court upstairs, including all-American McDonald's. Live entertainment is occasionally available, particularly during the school vacation periods. Centre hours are 8:30 a.m. to 5:30 p.m. Mondays to Saturdays and 10 a.m. to 4 p.m. Sundays.